Tesla has announced that all current Tesla Model S and Model X vehicles coming off the production line, as well as the future Model 3, will be equipped with hardware to allow the vehicle to achieve Level 5 autonomy and drive completely on its own without human input. Each Tesla vehicle will have a 360 degree view of its surroundings through the use of 8 cameras and a new computer that has forty times the processing power as current generation hardware. The new update which the company is referring to as “Full Self-Driving Capability”, or what Elon Musk refers to as “Hardware 2” cars, has shifted focus away from the current generation Autopilot “Hardware 1” vehicles. In place of the original Autopilot is an upgraded version of the driving-assist feature, now referred to as “Enhanced Autopilot”. Tesla Enhanced Autopilot is being offered as a $5,000 option at the time of purchase, or $6,000 after delivery, and will have all of the same features as the current generation of Autopilot, but with far greater accuracy. 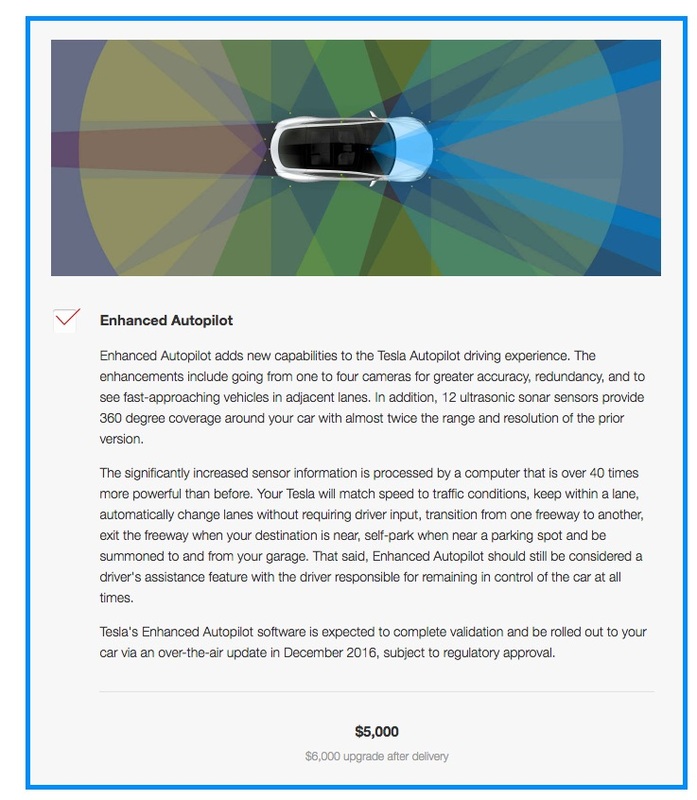 According to the feature description on Tesla’s Model S and Model X Design Studio, Enhanced Autopilot “will match speed to traffic conditions, keep within a lane, automatically change lanes without requiring driver input, transition from one freeway to another, exit the freeway when your destination is near, self-park when near a parking spot and be summoned to and from your garage”. 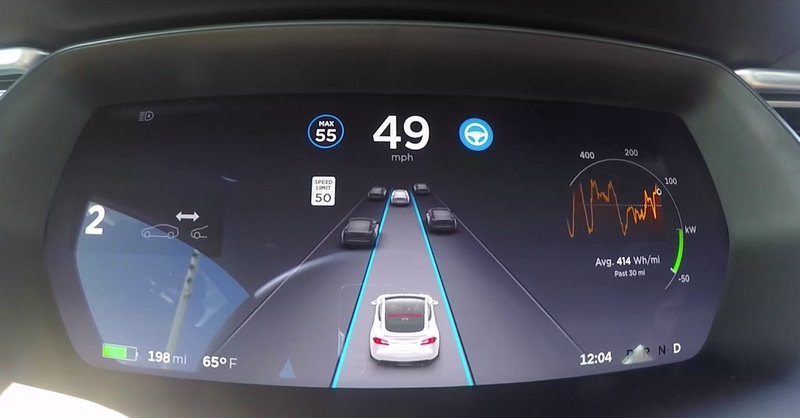 The existing Autopilot feature under Version 8.0 has been under scrutiny after some owners reported poor lane keeping abilities, inability to exit freeways and unpredictable vehicle movement and braking. But with 8 cameras and 12 upgraded ultrasonic sensors that have nearly twice the range of those found in prior versions of Autopilot, new “Hardware 2” equipped vehicles will be able to monitor activity around the vehicle, including blind spots. Forward-looking side cameras mounted to the vehicle will be able to track cars that unexpectedly enter into a driver’s lane. The side cameras will also provide another level of safety for the driver when entering into an intersection or four way stop. In addition, rear-side cameras will detect vehicles that approach from rear blind spots, thus allowing for safer lane changes, especially when merging into traffic. Despite the increased safety measures, Tesla notes that Enhanced Autopilot is still a driver’s assistance feature and drivers are responsible for maintaining control of their vehicles at all times. In terms of when owners can expect Enhanced Autopilot to be ready for use, Musk says an over-the-air update will take place at the end of the year subject to regulatory approvals. Musk notes that Hardware 1, or current generation Autopilot vehicles, will initially be better than Hardware 2 cars, but the two systems will have feature parity come December 2016.